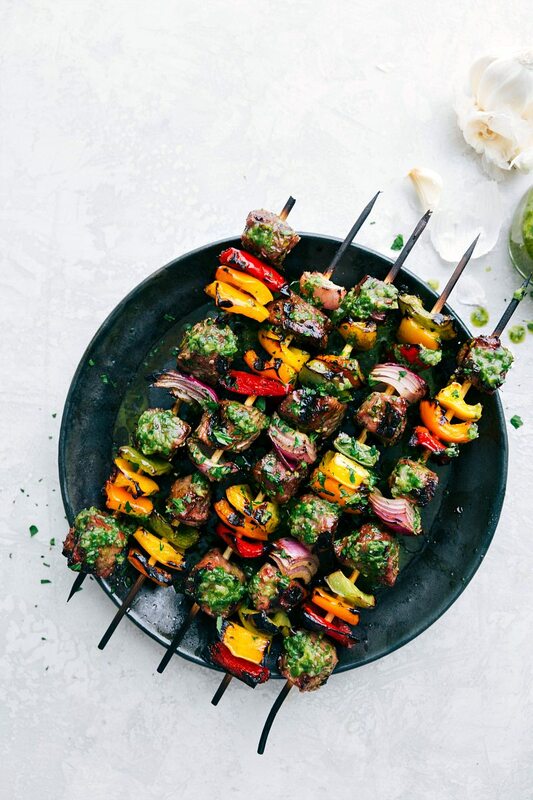 Thick cut pieces of steak are marinated in a flavorful blend of ingredients and then skewered with peppers and onion and then grilled to perfection to bring you the best steak kebabs! 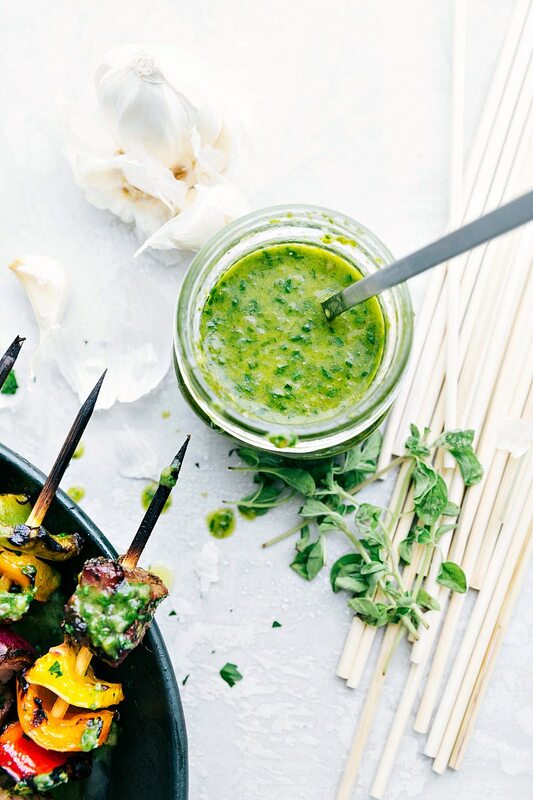 These kebabs are topped with a fresh basil sauce creating a dinner you’re going to crave all summer long! First off, what are shish kebabs? Shish kebabs are pieces of marinated meat paired with vegetables that are cooked/grilled and served on skewers. Today we’re marinating steak, tossing veggies in oil, skewering both together, and grilling it all at once! What kind of steak is best to use for steak kebabs? To get the meat on kebabs to grill well, you want to use meat that is both tender and has some fat. For these steak kebabs, I like to use a thick cut of sirloin steak cut into 1 and 1/2 inch pieces. Sirloin is going to provide a great balance of tenderness and flavor for these steak kebabs at an affordable price. A thick filet mignon, cut into large chunks is amazing in kebabs (maybe my favorite) but it’s pretty spendy! Another pricer alternative that is also great in kebabs is rib-eye. Can you make kabobs in the oven? While I will say I think grilling is the absolute BEST for kebabs, you can cook them in the oven. To do so, make sure the oven rack is in the top position and preheat the oven to 450 degrees F.
Line a large baking sheet with foil. Once you’ve assembled the meat (cut in 1 inch pieces for oven baking) and veggies on skewers, place those filled skewers on the prepared baking sheet. How long do you cook steak kabobs in the oven? Once, the skewers are all on the baking sheet, transfer the sheet to the oven and bake the kebabs for 8-10 minutes for medium-rare meat and lightly charred veggies. 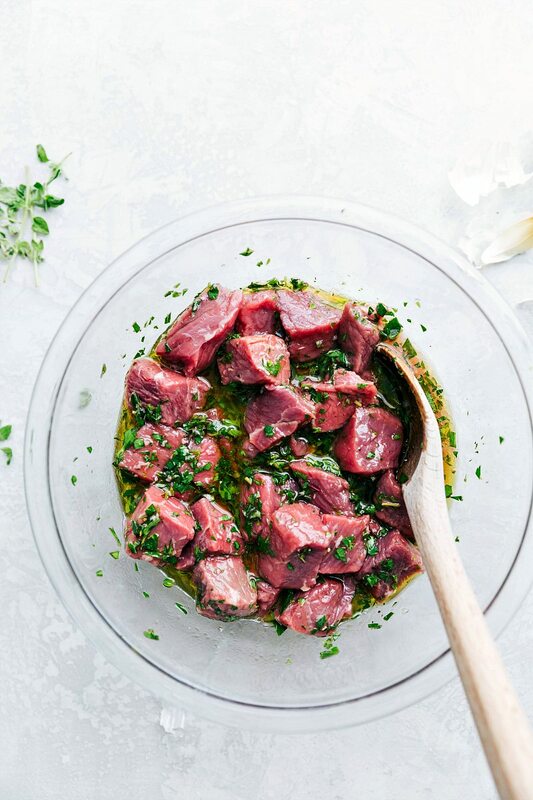 Start by combining the ingredients for the marinade: olive oil, red wine vinegar, minced garlic, chopped parsley, red pepper flakes, and black pepper. Cut the steak into 1 and 1/2 inch pieces and place in the marinade. You want to marinate the meat for at least 30 minutes and preferably 1-2 hours. You don’t want to marinate the meat longer than 4 hours because it does start to make the meat mushy. For the veggies: you’ll cut the red onion and bell peppers into 1 and 1/4 inch pieces. The veggies get tossed in oil and seasoned with salt and pepper. 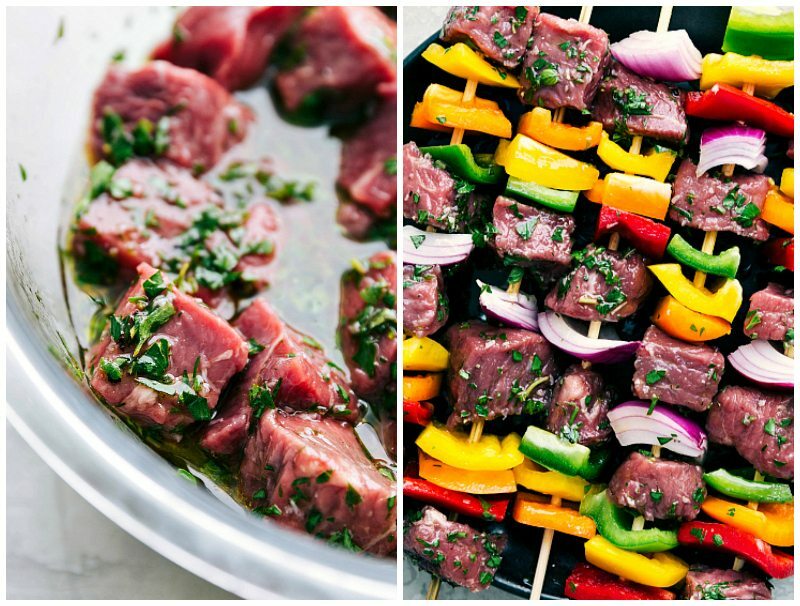 Once the meat is marinated and veggies are ready, you can assemble your steak kebabs! Do this by layering steak and veggies onto soaked wooden or metal skewers. And then they’re ready to cook! To cook your steak kebabs on the grill: Clean and grease your grill and then make sure grill is fully heated (to medium high heat) before adding kebabs. Place kebabs on grill and grill kebabs 6-9 minutes or until desired doneness is reached, rotating every 2-3 minutes for even grilling. Let those kebabs stand for a few minutes and then serve them with the amazing basil sauce! Combine the ingredients for the marinade: olive oil, red wine vinegar, minced garlic, chopped parsley, red pepper flakes, and about 1/4 teaspoon black pepper. Cut the steak into 1 and 1/2 inch pieces and place in the marinade. Marinate for at least 30 minutes and preferably 1-2 hours. Do not marinade longer than 4 hours to avoid mushy meat. If using wooden skewers, soak in water at least 30 minutes before assembling. Cut the red onion and bell peppers into 1 and 1/4 inch pieces. Place all the pepper pieces in a large bowl and lightly drizzle with vegetable oil and season to taste with salt and pepper. Toss to coat. Lightly drizzle the onion with oil and salt but don't toss so the pieces will stay together in chunks. 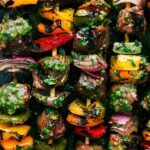 To assemble kebabs layer steak and veggies onto soaked skewers. Roll up a paper towel and soak in vegetable oil. Using tongs, brush the soaked paper towel over clean grill grates. Make sure grill is fully heated (to medium high heat) before adding kebabs. Place kebabs on grill and grill kebabs 6-9 minutes or until desired doneness is reached, rotating every 2-3 minutes for even grilling. 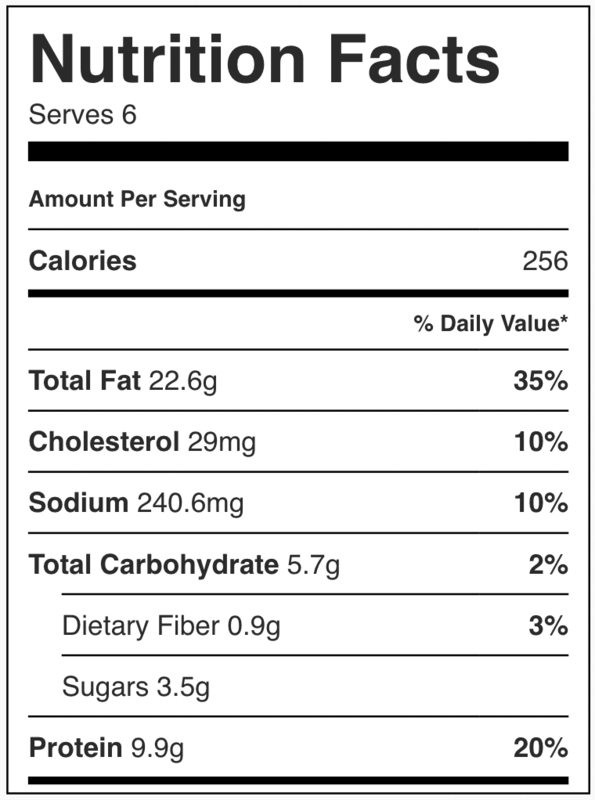 (Beef should be well seared on all sides and center of beef registers between 125-130°F (for medium rare) on an instant read thermometer, about 3 minutes per side -- they continue to cook off the grill a bit). Transfer skewers to platter and let rest for 5 minutes. In a food processor, pulse the garlic and shallot a few times. Add the basil and pulse until finely chopped. Add the vinegar, fresh lemon juice, and salt + pepper to taste (I use about 1/2 teaspoon of salt and 1/4 teaspoon pepper). Pulse a few times and while running, drizzle in the olive oil and pulse until smooth. Avoid pulsing the mixture too much with the olive oil as sometimes oil with metal can have a metallic reaction and alter the taste of the sauce. Serve sauce on top or alongside kebabs. Can’t wait to try that basil sauce on everything! 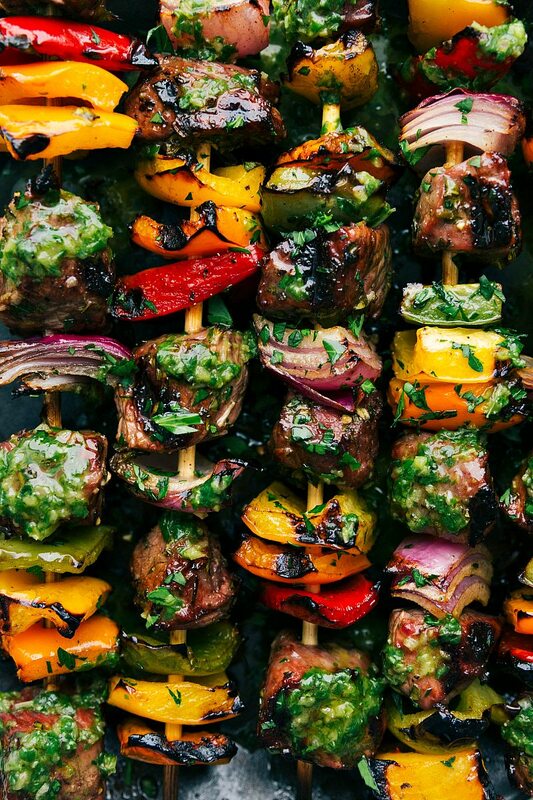 These steak kabobs look amazing, but all of your recipes look amazing as well. I am like a recipe junkie lol!! I have so many to try. This one I am going to try for sure this weekend. Keep them coming, their awesome. I’m going to pack these up to go camping for the weekend thanks for the recipe! !